Ethel Rogers ( the cook) in Warner Stage Company ‘s production of Agatha Christie ‘s And Then There Were None. 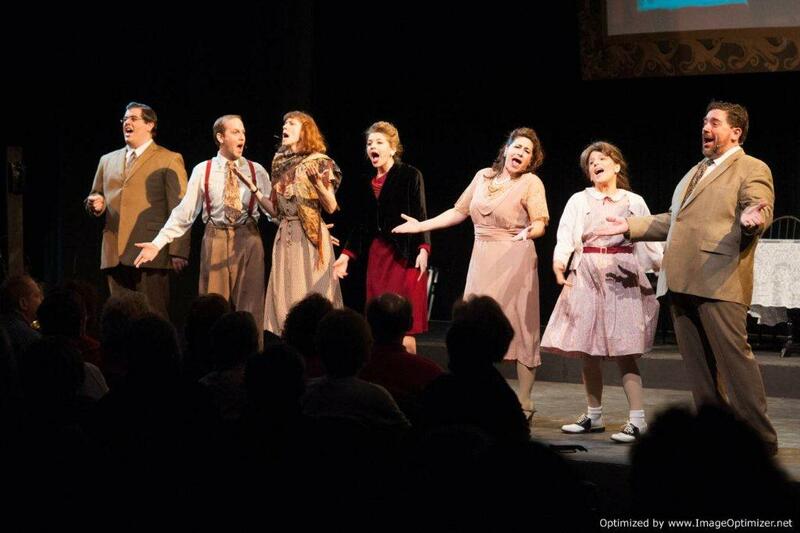 Shows run two weekends from September 23 to October 1. 4th Annual Celebration for the Bats! Help Gerri Griswold celebrate our planet’s most extraordinary creature! A lecture featuring a live Big Brown Bat will begin the evening’s festivities then head off to the Activity Shed for a special concert provided by the ever so talented Lana Peck!!!!! We can then count our bat colony as it emerges from the Green barn! Charming bat cupcakes and lemonade will be served (to humans..not bats..they prefer insects)! Pack a picnic or BYOB! The event is on rain or shine. Come out and show your support for bats! Lecture: 6:00 P.M., Concert: 7:00P.M. Please call 860- 567-0857 to register. FREE…Donations will be accepted to help defray the Conservation Center’s programming expenses. GlumPuppet Live: Share the Glum! Esoteric Modern Vaudeville! A night of live music, videos & mayhem with Drosh and Lana of GlumPuppet.com! The doors will open at 7:00 with the show starting promptly at 7:30. Desserts and refreshments will be available and donations will be gratefully accepted. For additional information, please call 203-266-6688. Wednesday, Feb. 26th at 8pm, I’ll be playing from my originals setlist and maybe add a few I missed. This is a really fun, informal and casual way to see live music from the comfort of your own computer or mobile device! You’ll be able to type messages to me on the scrolling chat board along side the screen and there’s even a virtual tip jar! this is also where you’ll go back to when the show starts. *word to the wise: don’t wait ’til 7:59pm to go to the link, you’ll need to create a username/password first to watch and that might make you a little late. I will probably go a bit over 30 mins, but just a heads up! 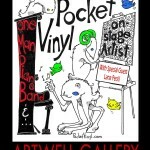 This month featuring local talents Robert C Fullerton, Mark Miller and Lana Peck! Come warm up with us and enjoy another evening of quality musicianship and personal stories as we move into our second exciting installment of this new monthly program! The rules for each gig are simple. We search and find some of the best singer/songwriters that CT (and beyond) have to offer. Each artist will then perform 3 songs from the Great American Songbook (Ellington, Gershwin, Porter, and the like), and 2 originals all while telling a few stories in between to wrap it all together. A Very nice evening indeed!! There will also be CD’s and goods for sale from each artist. I will be doing a live webshow on Concert Window, which starts at 9:00pm EST on January 14. Wherever you are in the world, you can tune in! I’ll be playing mostly original songs, possibly taking requests and answering your questions. 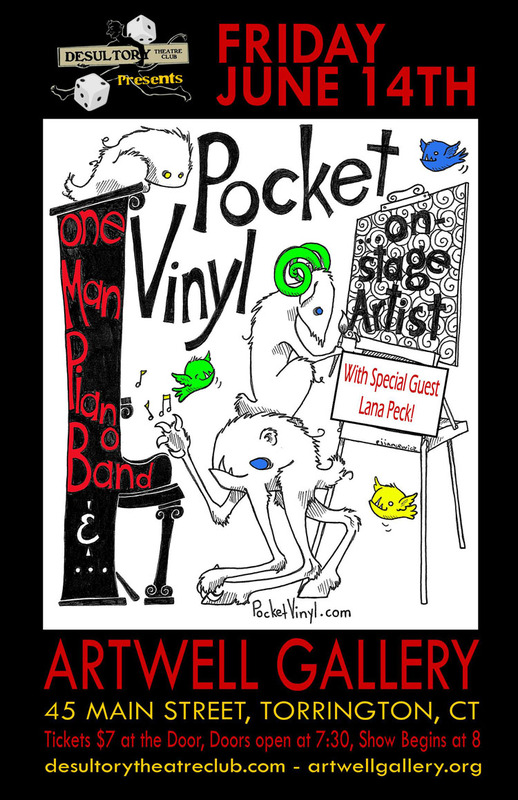 You can purchase online tickets on a pay-what-you-want basis starting now at http://www.concertwindow.com/shows/2662-lana-peck. The webshow will not be recorded – it’s offered in real time. For a fourth year, I have been asked to perform a set of my songs at this wonderful outdoor show! Presented by The Singer/Songwriter Network of Torrington in collaboration with the Torrington Historical Society, this performance concludes their series of evening concerts on the grounds of the Hotchkiss-Fyler House Museum at 192 Main St. Sharing the stage this year will be Anita Fearon (featured artist) and Thea Hopkins (special guest). See the “mini concert” link over to your right to see a sample video from 2011. Joining me on uke, will be my colleague Drosh. We’ll be playing my originals, including my GlumPuppet videos showcasing my “wickedly funny” style songs, and maybe toss in a few “hauntingly beautifuls,” like (Willow) If You’d Call My Name. Featuring nearly 50 international vineyards and acclaimed restaurants. Must be 21 or over with valid ID. *VIP tickets include private tasting at the event at 5:30pm. VIP reception at 6pm features premium wines, hors d’oeuvres, desserts and live entertainment (including me!). I’d been invited to play for the Library’s Summer Reading Series this year, so I asked my No Stress friends to come along. This venue is literally the front entrance to the Library and simply is too small to fit the whole band, so we had to kick some of us off this time. More mellow, quiet, fun tunes but more compact and intimate. Bring a lawn chair and we’ll see you there! Thursday, July 5, 2012. Another fine summer of playing at the Cobblecourt alley in the center of Litchfield with my bandmates! Save the date and dust off the lawn chairs! presented by The Singer/Songwriter Network of Torrington. Once again, I have been asked to perform a set of my songs at this wonderful outdoor show! See the “mini concert” link over to you right to see the video from last year. This year I will share the marquee with Gale Gardiner & Kathleen Kruze! For this weekend, as a part of the artists studio tour, you can get to see me wearing 3 of my various hats; singer/songwriter, lead singer for No Stress and GlumPuppet multi-media artist! *For Open Studios, I present a selection of my original songs and I am also joined by one of my fellow collaborators, Drosh, for a sampling of tunes from GlumPuppet played along with my accompanying video footage (many thanks to Artwell in Torrington for use of their projector/screen!). I am honored to have been asked to provide a short musical selection for Yom Hashoah on April 18th 2012, 7:30pm, at Beth-El Synagogue at 124 Litchfield St., Torrington, CT. I will accompanied by Eric Paradine on guitar and will be singing a traditional song in Hebrew and also a modern folk song written by singer/songwriter, Joe Crookston. The service will be mostly in Hebrew and English and will conclude with a candle lighting ceremony. It is open to the public. “Cabin Fever Party!” Saturday, March 10th at The Goshen Playhouse, Route 4 (rotary), Goshen, CT. Show is from 7-9pm and suggested donation: $5. Snow date: March 11, 2pm. 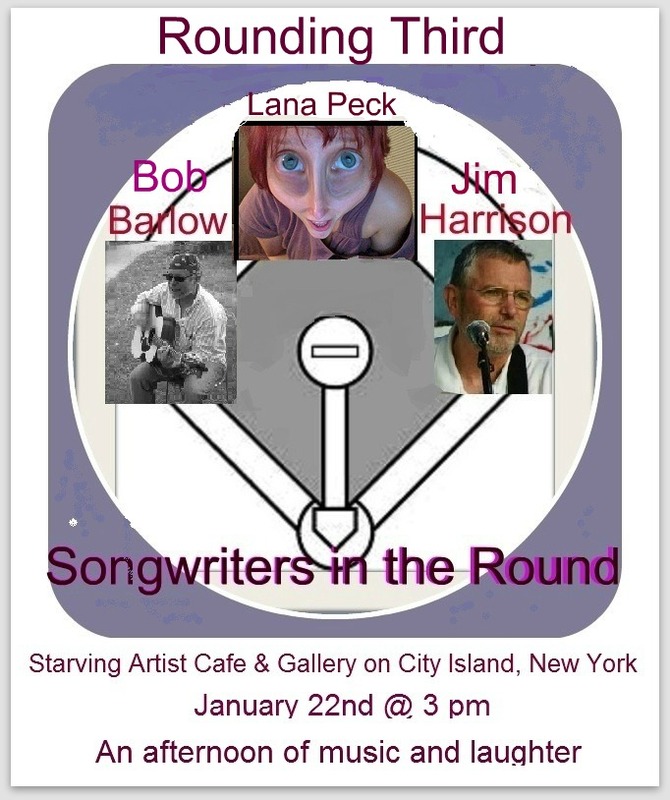 Sunday, January 22, 2012, 3-6pm at The Starving Artist Cafe and Gallery, 249 City Island Avenue, The Bronx NY, City Island, the Bronx New York. Bob Barlow, Lana Peck and Jim Harrison will be performing an afternoon of mostly funny, orignal songs. There might be a few serious songs thrown in there just to keep you off balance or even a cover or two. It’s sure to be a fun time. 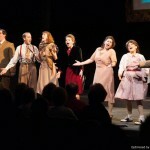 Saturday, October 29, 2011 at 5:30 pm at DON’T TELL MAMA(343 West 46th Street, NYC – 212-757-0788 ). PEOPLE YOU SHOULD KNOW … THE LADIES ARE IN THE HOUSE! THREE GREAT FEMALE SINGER/SONGWRITERS! Hosted by Sue Matsuki (doing original tunes by Mary Liz McNamara & Zo Lewis). $15 Cover Charge (just $10 for Students, MAC & Hotline Members) – 2 drink minimum. No credit cards.